'The Legend of Rock Paper Scissors,' written by Drew Daywalt and illustrated by Adam Rex, is an enjoyable play on the game of rock, paper, scissors. The rock, the paper, and the scissors, all coming from different parts of the house, both inside and outside, all feel that nothing is challenging them. So they seek out anything that will be able to defeat them. It is interesting that their goal in the story is defeat, but it truly shows how not everything is necessarily as it seems. When anyone plays a game of rock, paper, scissors, they most likely want to win, and it is doubtful that they ever are happy about losing. Yet this is what each of the items wants - to feel the pain of loss so they will understand and be able to empathize with all that they have conquered before. Even though the plot is interesting and stems from a refreshing and unique viewpoint, infusing a regularly played game with a fun backstory, the story often went on too long in parts. It could have been pared down a bit to make it a little easier for kids to engage with since it would have been quicker to read. Adam Rex's illustrations showcase the strengths of each of the three main characters and permeate the text of the story with more meaning as readers see the truth behind each character's thoughts and actions. 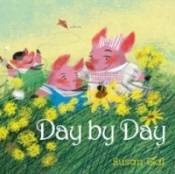 Much like Jon Scieszka's 'The True Story of the Three Little Pigs,' the story shows a different side of what everyone thought could only be thought of in one way and turns it on its head. It can open up some thought-provoking dialogue about understanding different perspectives among those who read it.